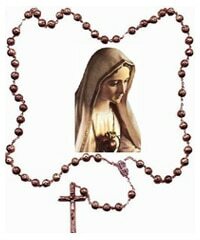 The Rosary is essentially the decades and their associated mysteries, and only these must be prayed to “pray the rosary”. Fatima Prayer: O my Jesus, forgive us our sins, save us from the fires of hell, lead all souls to heaven, especially those who are in most need of Thy mercy. Click on the play button below for each to proceed. On Mondays and Saturdays please pray the Joyful Mysteries. On Tuesdays and Fridays please pray the Sorrowful Mysteries. On Wednesdays and Sundays please pray the Glorious Mysteries. On Thursdays please pray the Luminous Mysteries (Coming Soon). (All) Hail, holy Queen, mother of mercy, our life, our sweetness, and our hope. To thee do we cry, poor banished children of Eve. To thee do we send up our sighs mourning and weeping in this valley of tears. Turn then, most gracious advocate, thine eyes of mercy toward us, and after this our exile show us the blessed fruit of thy womb, Jesus. O clement, O loving, O sweet Virgin Mary. (Leader) Pray for us, O Holy Mother of God. (All) That we may be made worthy of the promises of Christ. (All) O God, whose only begotten Son, by His life, death, and resurrection, has purchased for us the rewards of eternal life. Grant, we beseech Thee, that while meditating on these mysteries of the most holy Rosary of the Blessed Virgin Mary, that we may both imitate what they contain and obtain what they promise, through Christ our Lord. Amen. (All) In the name of the Father, and the Son and the Holy Spirit. Amen. implored thy help or sought thy intercession, was left unaided. Inspired with this confidence, I fly to thee, O Virgin of virgins, my Mother; to thee do I come, before thee I stand, sinful and sorrowful. O Mother of the Word Incarnate, despise not my petitions, but in thy mercy hear and answer me. Amen.